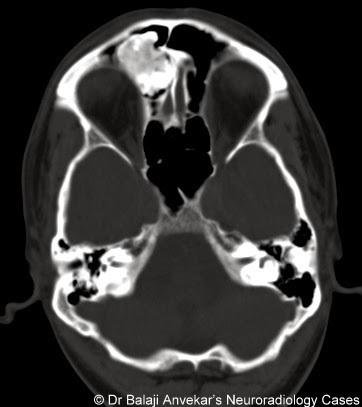 A 45 y o male presented clinically with right nasal watery discharge and recurrent meningitis. CT Brain bone window images show an Osteoma in right frontal sinus and adjacent anterior ethmoid air cell. Same case showing an associated right frontal sub dural pneumo cephalus secondary to erosion of overlying cribriform plate of ethmoid. 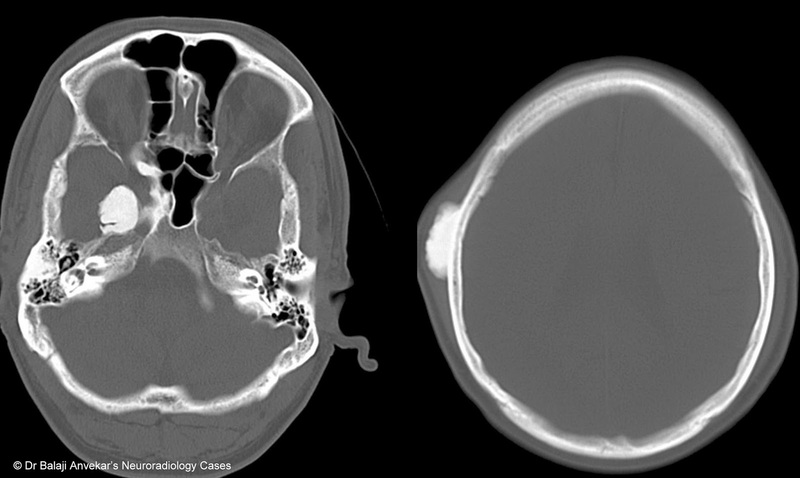 An osteoma of the paranasal sinuses is a common benign tumour, usually found incidentally in patients undergoing imaging of the sinuses or CT head, account for up to 3% of CT examinations of the paranasal sinuses. Common age group is middle age male predilection. Most osteomas are asymptomatic and are found incidentally, may become symptomatic either due to its direct mass effect or obstruction of normal sinus drainage. Presentation with pain is often a referred pain via the trigeminal nerve and a prostagladin E-2 mediated mechanism, there can be a significant inversely proportional discrepancy between the size of the lesion and the symptoms. Some osteomas are large and exophytic present as hard subcutaneous palpable swelling or compress structures, such as content of the orbit. Rarely an osteoma may encroach upon the brain, may even result in erosion of the dura with resultant CSF leak, pneumocephalus or intra cranial infection (meningitis, cerebral abscess) as in our case. More frequently they may impair normal drainage of one or more paranasal sinuses thereby resulting in acute or chronic sinusitis or even mucocoele formation. Distribution, Osteomas are frequently seen elsewhere in the head and neck, particularly the mandible and outer table of the skull vault. Within the para nasal sinuses the distribution is frontal sinuses. (most common) ~ 80%, ethmoid air cells ~ 15%, maxillary sinuses ~ 5% and sphenoid sinus is rare. A well recognized association with the Gardner syndrome. Osteomas are, as the name suggests, osteogenic tumours composed of mature bone. Three histological patterns are recognised. 3. mixed osteoma : mixture of ivory and mature histology. 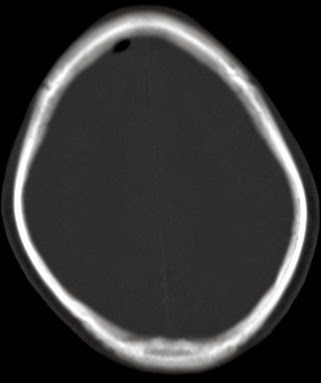 CT is the investigation of choice, demonstrates a well circumscribed mass of variable density, varying from very dense (similar in density to normal cortical bone) to less dense with a ground-glass appearance. They are seen either with a sinus or less commonly exophytically growing out of a sinus. On MRI, ivory osteomas are low on all sequence. Mature osteomas may demonstrate some marrow signal, but are also predominantly low on all sequence. In asymptomatic cases excision is not necessarily indicated. If sinonasal disease, where the osteoma is thought to be responsible for symptoms, resection is required performed either endoscopically or externally. Another case with two concurrent Osteomas, an inner table Osteoma at the floor of right middle cranial fossa and another is outer table Osteoma in right parietal region.